How long will my Lipolife® product keep once opened and stored correctly? Our stability testing has shown the product will have full efficacy for at least twelve months if stored correctly. Will mixing my Lipolife® product with water or juice destroy the liposomes? No however once mixed it should be consumed promptly to avoid oxidation. It should not be mixed in a hot drink as this will destroy the liposomes. When is the best time to take my Lipolife® product? For maximum absorption, the product should be taken on an empty stomach. Can I overdose on a Lipolife® product? No but as with all supplements you should speak with your doctor or healthcare practitioner for advice before taking a product for the first time. Are Lipolife® products made with non GMO materials? Shouldn't Lipolife® products be in little foil pouches to preserve the stability of the liposomes? No, our stability studies have shown that negligible oxidation occurs even after three months of repeated exposure. This is due to the specific manufacturing process employed by our laboratory. I'm allergic to soy, I see Lipolife® products contain lecithin derived from soy, does that mean I can't take Lipolife® products? The phosphatidylcholine in the product is derived from soy lecithin, at the point of manufacture there are no soy proteins left in the product. Furthermore, many of our products are now formulated with sunflower lecithin, denoted by SF. What is the alcohol content of Lipolife® products? The alcohol content varies across the range with a highest value of 4% and lowest value 0.9%. Does your laboratory test on animals? Absolutely not. Furthermore, we work hard to maintain an environmentally friendly workplace. What are the size of the liposomes in Lipolife® products? 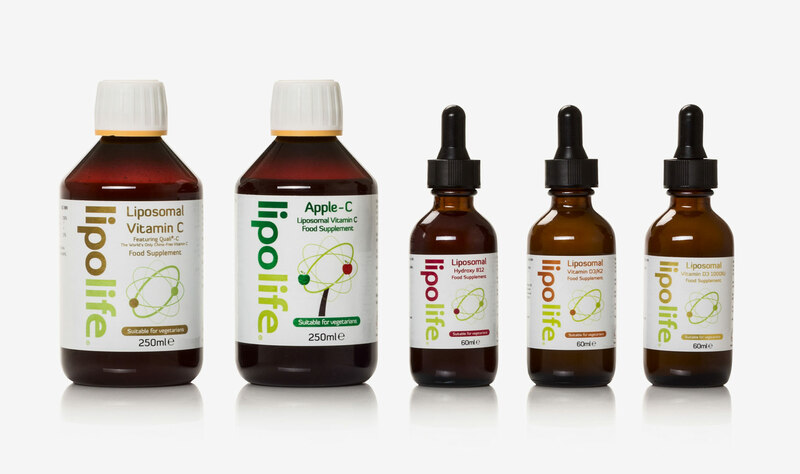 What is the source of Vitamin C in Lipolife® Gold and Apple-C? The Vitamin C in Lipolife® products is Quali-C Potassium and Sodium Ascorbate. Is the Vitamin C in your products food state? We use a combination of Sodium and Potassium ascorbates in Lipolife® Liposomal Vitamin C, these are not food state. Synthetic and food state Vitamin C is chemically identical; there are no known differences in biological activity. There have been at least two human studies that compare the bioavailability of ascorbic acid from synthetic and natural sources. The results of these studies showed no clinically significant differences. Does Lipolife® CoQ10 contain ubiquinone or ubiquinol? One of the reported benefits of using Ubiquinol over Ubiquinone is that it is better absorbed, particularly as we get older. Fortunately due to LET, absorption of CoQ10 in the ubiquinone form is not an issue and because Ubiquinone converts to and from Ubiquinol many times per second inside the mitochondria, it is the preferred ingredient in liposomal CoQ10. What Vitamin E is used and where is it from? A mixture of alpha, beta, gamma and delta tocopherols are put in the phosphatidylcholine as an anti-oxidant in the concentration of 0.001%. The Vitamin E is naturally derived from sunflower plant oils. What is the quality of the MK7 in Lipolife® D3/K2? The MK7 in the product is 99% Trans. With regards to the Aloe Vera used in Lipolife® Gold, what part of the plant is used and why? Around 0.1 ml Aloe Vera gel concentrate (1:10) per serving is present. The purpose is to increase the absorption of Vitamin C.
Why do you use Potassium Sorbate and how much is in your products? Potassium Sorbate is a salt of sorbic acid which is found naturally in some fruits and berries; it is commonly used as a food preservative to inhibit the growth of mould and yeast. More information can be found in the Ingredient Information section. Lipolife® products use minimal amounts of Potassium Sorbate, (0.2%). Are there plans to add more liposomal products to your range? We are always looking to increase our product range and have new products in the pipeline for 2019 and beyond. What is the source of the K2 in Lipolife D3/K2? The K2 is the Gnosis brand, which is derived from the natural fermentation of the bacteria Bacillus subtilis natto. vitaMK7® is the purest form of trans menaquinone-7 available on the market.